We may all be about to go a little jazz crazy this weekend but don't think this little beaut of a gathering has gone unnoticed. Oodles of Irish talent converge on the gorgeously green surrounds of Caherdaniel in Co. Kerry including Cork's very own electro enigma Carried By Waves, experimental Dublin troupe Come On Live Long and The G-Man's favourite capital critters, the incredible Little xs for eyes. A little podcast has been assembled for the obvious listening purposes. Official promises have been made by the organisers for "Music, Art, Poetry, Talks, Walks, Surf, Yoga, Food & Creamy pints by the sea.". Sounds pretty bloody amazing to me. Well known local public house The Blind Piper, or The Piper as it is more affectionately known, will house the majority of the music on the Saturday and Sunday. 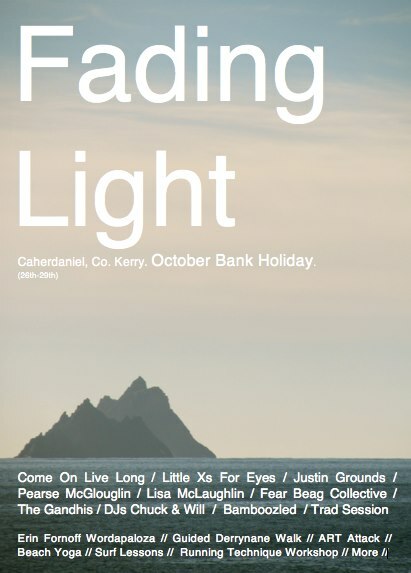 As you can imagine, tickets are limited so pop a mail to Fadinglightfestival@gmail.com with the night, your name, number of tickets required etc. so they can hold them at the book office for collection on the day.